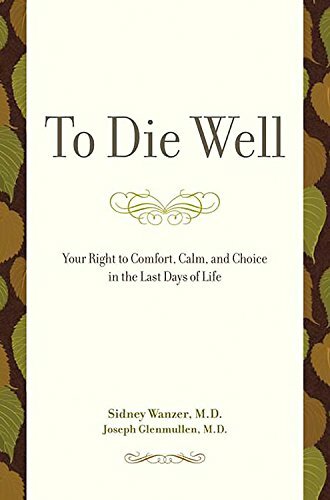 [PDF] To Die Well: Your Right to Comfort, Calm, and Choice in the Last Days of Life | Free eBooks Download - EBOOKEE! Description: The knowledge provided in this book is both comforting and powerful. Patients who know their right to refuse treatment and the legal ways to bring about death if pain or distress cannot be alleviated will be spared the frightening helplessness that can rob their last days of meaning and connection. Drs. Wanzer and Glenmullen do not shy from controversy. They make clear what patients should expect of their doctors, including the right to enough pain control even it shortens life. They also explain the legal ways hasten death that are possible for anyone, and clarify the controversies now surrounding those that require a doctorâ€™s help. Compassion and reassurance blend with direct, honest fact in this book that every one of us should have before it is needed for ourselves or our families. No comments for "[PDF] To Die Well: Your Right to Comfort, Calm, and Choice in the Last Days of Life".